In this beautifully written and delightful novel, Grenville seamlessly weaves historical fact together with a multitude of philosophical questions in order to create a vivid and compelling story (Eileen P). The book explores the huge themes of friendship, the conflict between cultures, and courage. As one man discovers himself he finds that he has it within him to follow his conscience no matter what the cost. All intertwined with the magic of language, mathematics, and astronomy (Maryanne K). If you are interested in the Aboriginals and how the first penal colony was settled in New South Wales in the 1780's, The Lieutenant is the book worth reading. Although it is fiction loosely based on a real person, the rich details of daily life, conflicts, and diversity of language drives the story leaving its readers to want more (Marion C). The historical background adds a new dimension to a story you may think you know. Questions of culture and morality left me thinking about this book long after I finished it. Book clubs will enjoy this as will readers who liked The Forgotten Garden or Olive Kitteridge (Susan B). Of particular interest to me was the way in which the author portrayed the young lieutenant's burgeoning preoccupation with the intricacies of the aboriginal language and culture. I very much liked Grenville's use of language and am looking forward to reading an earlier book of hers, The Secret River next (Susan K). Kate Grenville has a new fan! Her simple and straightforward style belies a depth and complexity of both story and characters. This is not only a novel of science and exploration, but also of discovery - discovery of place and peoples and language, discovery of self and purpose. (Madeline M-S). This was a hard book to finish because I found myself lost in thought and not reading. A beautiful book (Sally G). The story is lacking in purpose, there seems to be no theme nor any successful conclusion (Margo A). I think this is a good book, well worth reading, but feel the author missed the opportunity to develop it into a great book with a more powerful story (Jean T); not enough time is spent on any of the elements of the story. I was left wishing for a deeper examination of the characters and events (Katherine Y). The Lieutenant revisits the same period Grenville wrote about in The Secret River (2005), the first years of the Port Jackson penal colony, but this is a more compact, leaner work. Although based on the diaries of William Dawes this is not your typical historical fiction - Grenville is as much, if not more, focused on observing the mind of her protagonist than she is in exploring the vista he beholds. As we inhabit his mind, his moral dilemmas become ours, and we share his isolation. Written with a poet's sensibility, this is an adventure into the nature of language and culture and of how people can connect across seemingly impenetrable barriers. 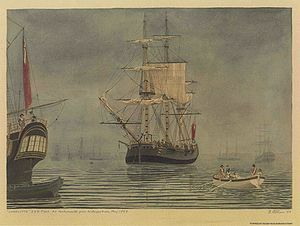 Above: The Charlotte, one of the eleven ships in the First Fleet, at Portsmouth before departure in May 1787. Right: A studio photograph of a convict showing the convict uniform and the use of leg irons. c.1880s. Kate Grenville talking about The Lieutenant. Incidentally, this being an Australian book, the title should arguably be pronounced "leftenant" (British and Australian English), not "lewtenant" which is American English! This review was originally published in October 2009, and has been updated for the September 2010 paperback release. Click here to go to this issue.